KATUAIL, KERANIGANJ: The world class ship MV Bashundhara Logistics-33, built in own shipyard of Bashundhara Group, started voyage Thursday from Katuail Shipyard of Keraniganj of Dhaka district. Apart from this, constructions of more 12 same kinds of ships, capable of holding 2,500 metric tonnes weight, are underway in the shipyard. 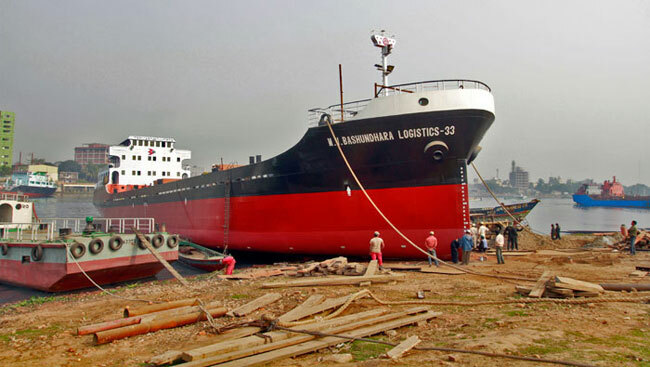 Officials of the shipyard said the construction of MV Bashundhara Logistics-33, which costs around Tk 10 crores, began on February 10 in 2010 getting approval from International Classification Society. United Naval Architect designed the ship that is 72 meter long, 13.5 meter wide and 4.7 meter deep. The official also added that the rest 12 ships will also start voyage by this year. On November 12 in 2011, Bashundhara Logistics-35 started voyage and it is currently carrying goods within the country. These ships will be used basically to carry the goods of Bashundhara Group. The Bashundhara Steel and Engineering Shipyard was established in Katuail of Keraniganj in 2002. Bashundhara Logistics-21 and 22, 35 sand-carrying vessels and 10 dredgers were constructed in the Shipyard. Two dredgers have also been exported to Nigeria in 2005.